At the bottom of this post are derived allele counts and total numbers of reads for SNPs that have a large effect on phenotype for genomes from the part of the aboriginal population of the Canary Islands that was descended from Berbers. Nonzero derived allele counts are highlighted. Note that small derived allele counts may be due to DNA damage. The paper that the samples below came from paints a picture of an aboriginal population of the Canary Islands which was overwhelmingly homogeneous, and descended from Berbers or a Berber-like population, with only “possible low-level gene flow” or “possible small-scale introgression” from non-Berber populations, which they claim would have taken place after the Berbers first populated the islands. This picture is largely in line with the recent, politically-correct narrative from the “scientific community”, which is that prior to the 15th century AD the Canary Islands were inhabited by Berbers and no one else. This narrative is false, and the authors of the paper must know perfectly well that it’s false. In my post on the Chachapoyas from 2014, I cited this 2009 paper, which found that 3 out of 30 Guanche Y-DNA samples belonged to the European haplogroup R1b-M269, and that 2 out of the 30 belonged to the European haplogroup I. One of the 30 samples was identified as P*, which is almost certainly in actuality the European haplogroup R1b-V88. Later, this 2017 paper (whose main results can be seen here for free) found that 7 out of 16 Guanche Y-DNA samples from the island of El Hierro belonged to R1b-M269. The fact that these European haplogroups were found in Guanche DNA samples is not mentioned once in the new paper, and not one of the new paper’s samples belonged to these European haplogroups, which is quite convenient for the recent PC narrative. In my Chachapoyas post I noted that parallel to the heterogeneous mix of European and Berber Y haplogroups among the Guanches, there was a heterogeneous mix of phenotypes among them, with some of them having traits typical of modern Northern Europeans (including fair skin, blond and red hair, and blue and green eyes), and others having traits typical of the earliest inhabitants of North Africa (darker skin, dark brown or black hair, and brown eyes). 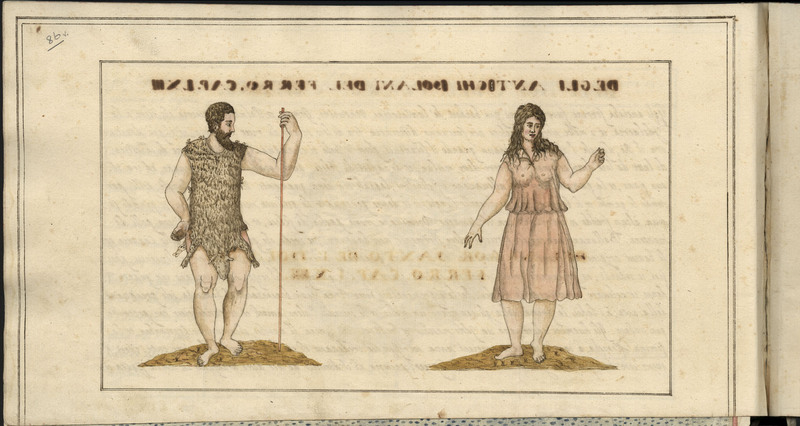 In the new paper the authors state that “at least for this sample of Guanches the dominating phenotype was lactose intolerant, dark hair, light or medium skin color, and brown eyes”, as if they were unaware that there are other Guanche remains, conveniently “overlooked” by their paper, which would certainly yield very different DNA results. The distribution of these heterogeneous phenotypes differed both between the islands of the Canary archipelago and within each island. The Guanches in the northern part of Tenerife tended to have lighter pigmentation, while those in the southern part tended to have darker pigmentation. The Guanches of Tenerife on the whole tended to have lighter pigmentation than those of Gran Canaria. The Guanches on the easternmost islands of Fuerteventura and Lanzarote were on average the darkest of the Guanches, which suggests that the earliest inhabitants of the islands were those with a Northern European phenotype, and that the Berbers, with their darker features, arrived later and partially displaced the Europeans, with more displacement occurring on the islands closest to the African continent. 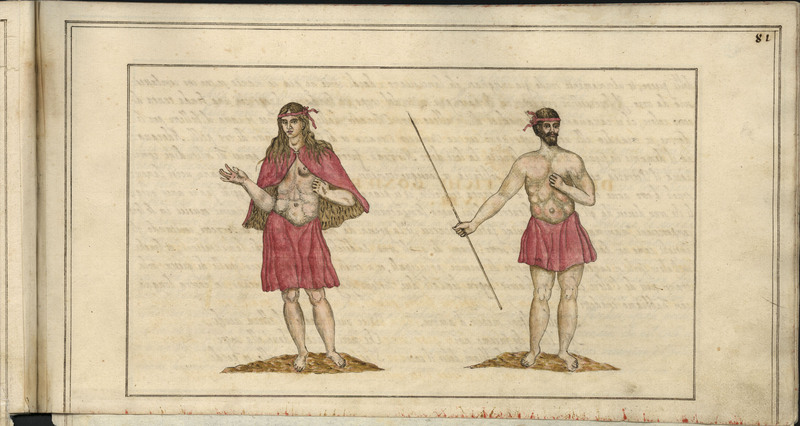 Espinosa and Galindo agree that some of the inhabitants of the island were fair and others dark and it is extremely probable that social lines followed this racial division, although it is cited by Espinosa as a topographical distinction between the people of the north and those of the south. It seems probable too that the flock-owning aristocracy was the blond element and that the peasantry was gathered from the small brunet and more brachycephalic element, from the fact that the blonds were said to be on the northern side of the island, which includes Laguna and the Vale of Orotava and all of the more pleasant and fertile areas of the island. Furthermore one cannot help being influenced by the fact that the tall, blond, pastoral people have almost invariably established themselves as military overlords of the people with whom they have come into contact throughout the Old and New Worlds. That the brunet population should be larger toward the south of Tenerife is natural when one considers, on the one hand, the aridity and relatively undesirable character of that part of the island and, on the other, its proximity to Gomera and Hierro where the people were darker. Note that, as in ancient Peru, only members of the Guanche upper classes were mummified after death. Their mummies were placed in the many caves on the islands. The members of the Guanche lower classes were simply buried. Note also that the DNA samples for the new paper didn’t come from Guanche mummies, but from detached skulls. The Italian military engineer Leonardo Torriani lived on the Canary Islands between 1584 and 1596, when he was employed by the Spanish to work on the islands’ defensive infrastructure. During his time there he wrote Description and History of the Kingdom of the Canary Islands. 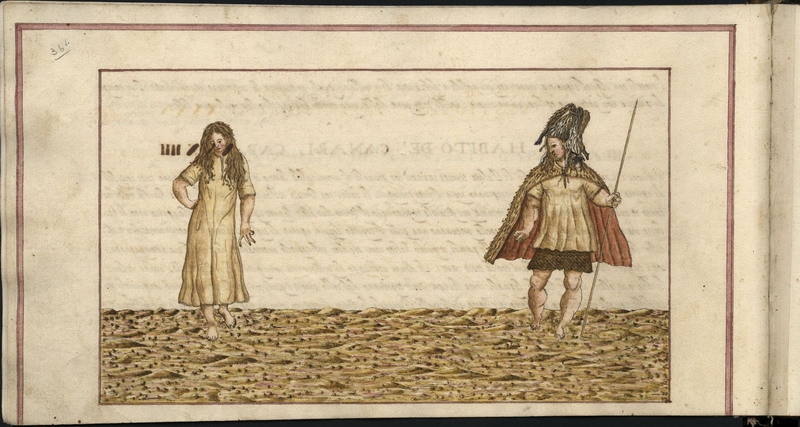 A color scan of the original manuscript in Italian can be downloaded here, and a black-and-white scan of a Spanish translation of the book can be downloaded here. 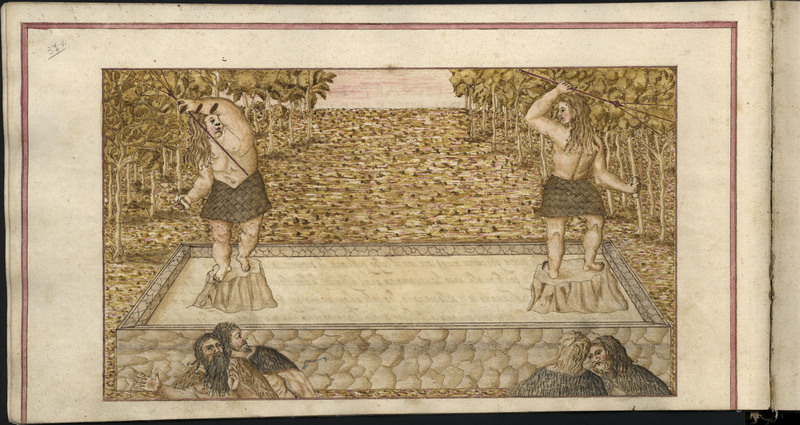 The book includes four watercolor paintings of Guanches on different islands, shown below. The Guanches in the first, third, and fourth paintings have a medium brown hair color, while the Guanches in the second painting, which are shown performing a type of ritual combat on the island of Gran Canaria, have rosy cheeks and long blond or light brown hair. 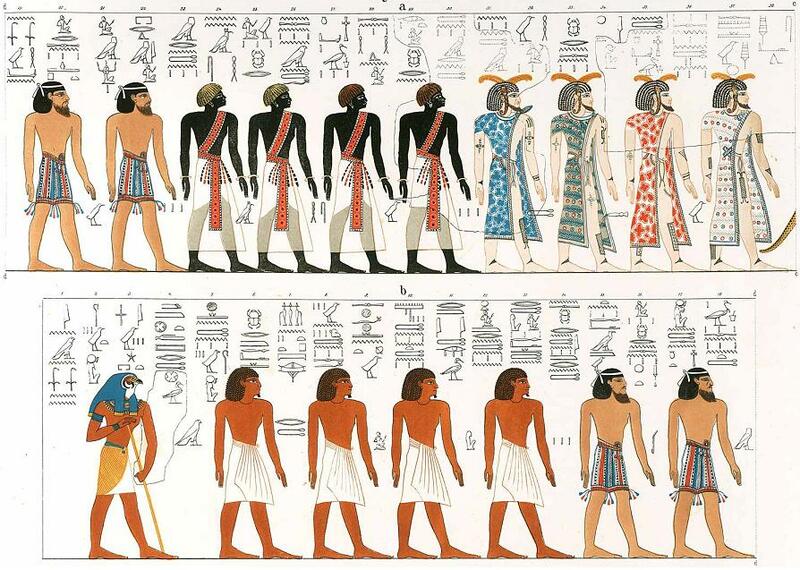 In my post on ancient Egyptian genomes I included the two images below, which are from murals illustrating the Book of Gates in the tomb of pharaoh Seti I, who ruled Egypt from 1290 to 1279 BC. The four men on the left of the first image and the four men at the top right of the second image are ancient Libyans, and in my post I noted that they look more like modern Northern Europeans than modern Northwest Africans. On pages 39–41 of his 1914 work The Eastern Libyans, Oric Bates discusses the presence of people with Northern European features in North Africa. He observes that ancient Egyptian artwork from the Old Kingdom (2686–2181 BC) depicting Libyans shows only people with dark features, while such artwork from the New Kingdom (1550–1069 BC) shows people with predominantly Northern European features, including fair skin, blond and red hair, and blue eyes. This observation is consistent with a migration of people coming ultimately from Northern Europe into North Africa around 2000 BC, which is around the time that Indo-Europeans belonging to Y haplogroup R1b-M269 first started migrating from Northern Europe into the Iberian peninsula in large numbers. It appears that this southward migration did not stop at the Strait of Gibraltar, but continued into North Africa, and also brought R1b-M269 and Northern European physical traits to the Canary Islands. This southward migration of R1b-M269 people took place around the beginning of the Bronze Age in Western Europe. In my White Gods post from 2013 I included photographs of spiral petroglyphs on the island of La Palma in the Canary archipelago. This page and this page note the strong similarity between these Canary Island petroglyphs and Breton and Irish petroglyphs which are generally assigned to the Bronze Age. It’s possible that the haplogroups I and R1b-V88 found in Guanche DNA samples entered the Canary Islands around 2000 BC, as R1b-M269 did, but it seems more likely that they were brought to the islands as the result of the earlier expansion of the Megalithic culture from Iberia into Northwest Africa. I mentioned this expansion in connection with the spread of R1b-V88 from Europe to Africa in my comments in this thread. Another commenter in the thread noted that this expansion took place during the most recent Green Sahara period. The general scenario that I proposed in that thread was later confirmed by this paper on Neolithic DNA samples from Morocco, which showed a significant migration of Europeans from Iberia into Morocco between 5000 and 3000 BC. The fact that the Berber migrants to the Canary Islands belonged to Y haplogroup E1b1b-M81 implies that they must have arrived there relatively recently, because E1b1b-M81’s TMRCA (time to most recent common ancestor) is only 2,300 years ago. The Berber Guanches may have been descended from Numidians, whose kingdom lasted from 202 to 40 BC, and whose king Juba II (52 BC – 23 AD) is known to have sent an expedition to the islands. The latest paper on Guanche DNA, with its convenient omission of samples from European Guanches, shows that, as with the ancient European inhabitants of the Americas and Polynesia, the leftist, anti-White “scientific community” will do everything in its power to suppress knowledge of the ancient European inhabitants of the Canary Islands. Can you loook at i0559 Quelinburg and ATP3 samples with more snps? There more snps than before. There more snps than before. I don’t know what you’re referring to here.